Football fans won’t be able to forget about the ‘No Call’ from the NFC Championship game while they’re in Atlanta for the Super Bowl. 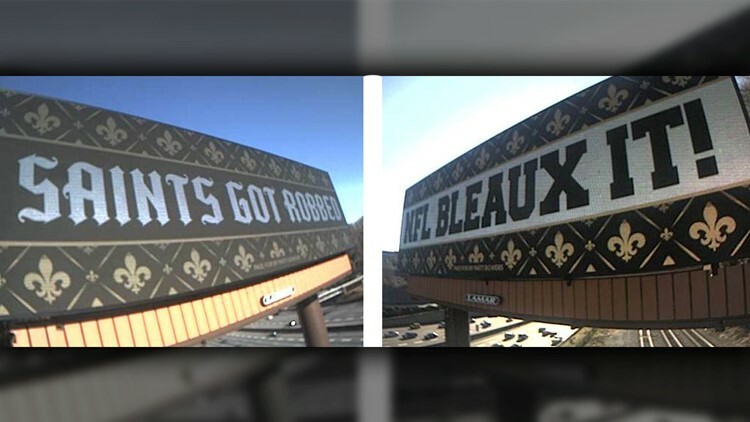 Local entrepreneur Matt Bowers paid for eight billboards in the Atlanta area with messages like ‘SAINTS GOT ROBBED” and “NFL BLEAUX IT!” displayed on them, including one next to the Mercedes-Benz Stadium where the game will be played. Bowers, who owns multiple local car dealerships, used his connections with dealerships in the area to buy advertising space on the billboards. “They knew immediately where I was going,” he said. All eight billboards will be up through the Super Bowl.